Americans generally eat anything that moves (possum, snake, turtle, squirrel, etc.) with the side dish of anything that grows (sprouts, green beans, asparagus, etc). That’s why it always surprises me when my co-workers make disgusted faces and puking noises when I say something about beets. 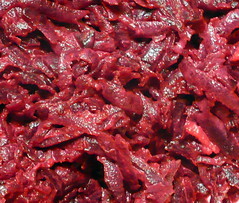 Why beets were chosen for the role of the hated vegetable is still unclear to me. What’s clear is the fact that they are delicious, slightly sweet, low calorie and help cure everything from cancer to icy roads. I, on the other hand, love beets and eat them frequently. They can be boiled, roasted, steamed, microwaved and eaten in soups (readers of this blog already know about borscht), salads,by themselves and with other vegetables. 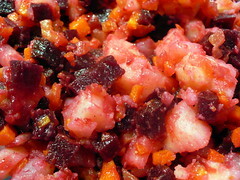 My favorite simplest beet recipe is just shredded cooked beets, little bit of minced garlic, mixed with some mayo or sour cream. For a more complex but still easy to make salad I like vinegret (mine is not exactly like this guy’s recipe but he took better pictures). 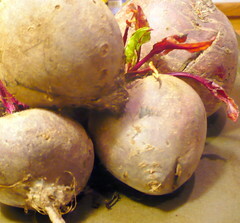 So forget your childhood fears and on your next trip to the store buy a bunch of beets. You’ll be peeing red for a week! P.S. No matter what you’ve been told by crazy vegetarians, the root is the edible part of the beet plant, leave the tops for your pet goat.